The former head of Veterans Affairs says White House claims that he resigned are wrong. And the terms of his departure could impact his replacement. 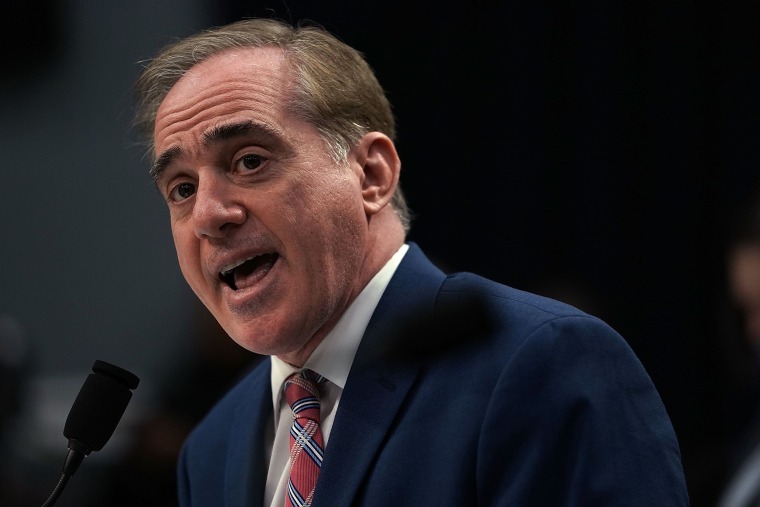 WASHINGTON — David Shulkin maintained Sunday that he was fired as secretary of Veterans Affairs and did not resign, despite such claims from the White House. “I came to fight for our veterans and I had no intention of giving up,” Shulkin said Sunday on “Meet the Press.” “There would be no reason for me to resign. I made a commitment, I took an oath, and I was here to fight for our veterans." A White House spokesperson told Politico on Saturday that Shulkin had “resigned,” despite the former Cabinet member’s public statements saying otherwise. And asked on “Meet the Press” if he had submitted a letter of resignation, Shulkin responded, “No, I did not." The terms of Shulkin’s departure could have an impact on President Donald Trump’s ability to pick a replacement, as some legal experts believe federal law could limit the president's ability to fill the position if Shulkin did not resign. Trump announced on Twitter Wednesday that his White House physician, Adm. Ronny L. Jackson, would be appointed to the role. Shulkin said he found out about his dismissal in a phone call from White House chief of staff John Kelly shortly before the tweet was sent. “He just simply said that the president had decided that he needed to make a change,” Shulkin said. Shulkin said he spoke with Trump mere hours before the tweet was sent, and that the call did not leave him with any impression that he was about to be ousted. Trump told an audience in Ohio last week that he wanted to make changes at the agency in favor of "real choice," and because he "wasn't happy with the speed with which our veterans were taken care of." Rumors of Shulkin's departure had swirled around Washington for weeks, and the V.A. — a sprawling agency of 370,000 employees and the second-largest department in the federal government — has faced criticism on wait times, caseload and more for many years. Shulkin wrote in a New York Times op-ed this week that advocates of privatizing the agency saw him as "an obstacle ... who had to be removed." He acknowledged Sunday that he internally feuded with political appointees and tried to diminish their access when the disagreements became more pronounced. "When the political appointees decided that they were no longer going to participate as an effective member of my team, when they had memos showing that they wanted to have me removed, my deputy secretary removed, my chief of staff removed, of course I limited access to those people," he said. "They no longer were willing to be working effectively with us in a way to improve care for veterans." Sen. Ron Johnson, R-Wisc., also on "Meet the Press," didn't object to the decision to remove Shulkin, saying he felt "presidents do deserve to have advisers that actually agree with them on policies." But he felt Trump's method of announcing the decision on Twitter was not helpful for the administration's efforts to recruit skilled candidates for other positions. "It's not the way I'd do it," Johnson said. "I think the president does need to understand the effect it has on attracting other people." Despite what he described as an abrupt end to his tenure, Shulkin on Sunday sounded resigned to the fact that his time working for the agency was over. "The president has the right and ability to change his mind," he said. "And he needs to have people around him that he's comfortable with, and he made the decision to make a change."